Merav has two great loves which have stayed with her ever since she was a young girl-writing (mainly poetry) and dogs (all kinds!). Over the years, she has found various ways to express these passions. About a decade ago, out of a desire to respond to and grow her love for those creatures, she became a professional in training and behavioral treatment for dogs. As part of that, Merav began incorporated her second great love--writing on topics connected with the world of dogs, both for children and for adults. As a firm believer that raising dogs and observing their behavior can teach us many important life lessons, she decided to write a series of rhyming books for children which use dogs' world. The purpose of the books is to share with a younger generation valuable life lessons in compassion, responsibility, generosity, and acceptance. Thus, Mozzi was born, along with this new series of books. I love dogs. Always have, only it wasn’t until I was an adult that I could make the decision to own a dog. I learned quickly that it was a job, one that I did gladly and with an open heart. Dogs can teach us so much. I know mine taught me a lot. Dogs know the true meaning of family; it’s important to them and they make us quickly realize how important family is to us and that our family dog is exactly that: family. They teach us the importance of accepting whoever and whatever someone is, regardless of the pedigree, the color, or any other differences. We are, after all, different and unique. Dogs teach us about respect, independence, responsibility and so much more, but the biggest lesson and the most important one we learn from dogs is how to love – unconditionally. Mozzi is not a pedigree dog. He’s basically a mutt, a mixture of several breeds. But Mozzi is pure love. And he teaches his young owner, Tommy, so many valuable lessons which through sharing his story he’s able to teach other young people, too. 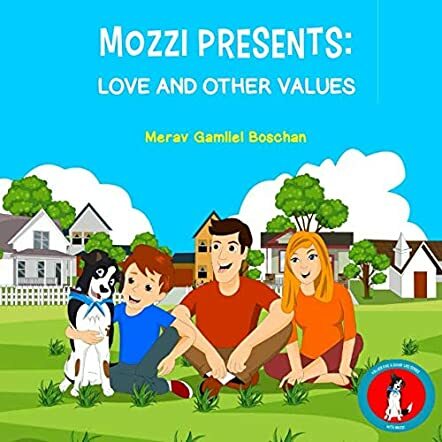 Merav Gamliel Boschan’s picture book story, Mozzi Presents: Love and Other Values: Dogs Teaching Kids Good Values and Emotions, is a real treasure. Told in rhyming verse and colorfully illustrated, this story expounds on the joys of owning a dog, while at the same time educating young readers on the importance of taking care of one’s dog (responsibility), loving him or her and learning from him or her. Truly valuable lessons which sometimes only a treasured pet can teach us, young or old.